This item was fully overhauled and repaired in Tokyo. 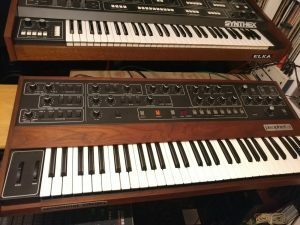 ” Prophet 5 rev3.3 120 memories plus midi, recent serial, completly refurbished and calibrated from a dave smith associated laboratory in italy in this year. “This item was part of an estate sale of a musician friend who passed on. 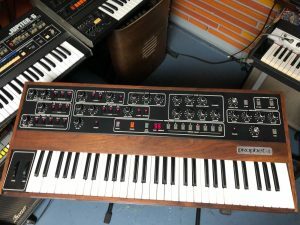 “Sequential Circuits Prophet 5 Version 3.3 synthesizer in good condition. I am the original owner of this magnificent keyboard. Only used in the studio on countless recordings. Unfortunately this keyboard has been in storage and is due for some maintenance. The keyboard works, all potentionmeters work, all LED works, Pitch and Mod wheels work. Some of the J wires need to be replaced so some keys do not trigger a sound. Also the rubber key stops need to be replaced on the entire keyboard. Not necessary if your’e using MIDI but if your playing it you will get tired of all the key clacking. All of these parts are available at WineCountrySequential or you could have them refurbish the keyboard. The wood casing is in good condition except for a dent on the front rail by the name plate, see photo #5. The Star case is in good condition but needs to be refoamed. Please keep in mind that this is a vintage keyboard and will require some minor repair before you start using it on a gig. This will be a fine addition to any keyboardist collection. 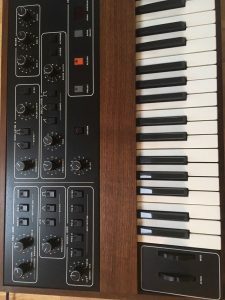 “Up for sale is a Sequential Circuits Prophet 5 Rev 3.3 Synthesizer with Midi in excellent condition. The synth was fully serviced several weeks ago and has a new battery, cleaned ic sockets, aligned j wires, all switches, jacks, controls and connectors cleaned as well. 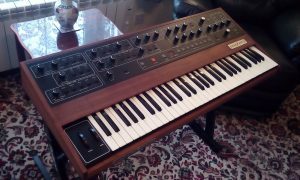 “I am selling my Rev.1 Prophet 5, S/N 009. This unit was modified to work with the Powell Probe – you can see some modifications on the rear panel photos. It’s fully functional, having received a thorough service job by Wine Country Sequential. It’s still there in San Jose, CA for local pickup, which would be the easiest, and would ship from there (contrary to any other statement here in the listing). “For sale is one Rev. 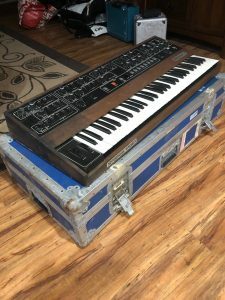 2 Prophet 5 synth. This unit has been professionally maintained by techs in the Bay Area, and is in great condition. It has the analog.fi firmware update professionally installed. More information on that upgrade can be found here: http://www.analog.fi/index.php?option=com_content&view=article&id=11&Itemid=9 Among other things, this upgrade improves the tuning and allows for a greater degree of usability on the front panel of the synth. Included is the original OS chip, in case you would like to revert to the stock OS at some point. It had a full keyboard assembly rebushing done a year ago, as well as a PSU upgrade (see external heat sink in photos), which allows for a more stable and cool operating temperature. At that time, the eletrolytic caps were changed, and all voices were tested and calibrated. One of the first fully programmable polyphonic analog synths, the Prophet 5 is the most classic synthesizer of the eighties! 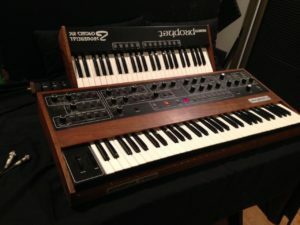 It is capable of a delightful analog sound unique to Sequential’s Prophet series in which the P5 is King! Five voice polyphony – two oscillators per voice and a white noise generator. The analog filters, envelope and LFO all sound great and are extremely flexible. Disassembled and properly burnished the buss bars. Carefully burnished all J-wires for a solid electrical contact with buss bars. Coated buss bar and J-wires with conditioner to preserve for many years to come. Leveled keyboard and cleaned all keys properly. Replaced all key bushings with new, lubricated ones. Cleaned the inside of the chassis of any debris and dust. Cleaned and lubricated all pots and switches. All work perfectly, no noise. Replaced lithium battery that backs up internal memory. Replaced a faulty transistor on CPU board. Carefully lubricated and treated all connectors. Upgraded power supply to latest SCI spec. Calibrated all functions that needed to be brought back to factory spec. Carefully calibrated Poly Mod section, so all oscillators sweep the same. Upgraded firmware with the Tauntek Mod – adding significant new features. All knobs were removed and cleaned. Cleaned the case, front panel and polished the wood to perfection. Front badges were replaced with NOS authentic badges from Wine Country (EXPENSIVE). Still have plastic on them. 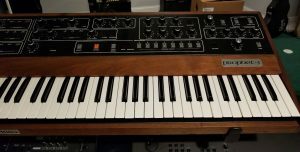 “For sale is my Sequential Circuits Prophet 5 vintage analog synthesizer. This is a very rare Rev 2 version with the sought after SSM chips. It’s in great shape and 100% fully functional. It was just serviced by Wine Country a few months ago. Wine Country are original Sequential Circuits guys and known as the best place to service old SCI gear. They fully went over the unit and brought it up to spec, over $800 in servicing, including new bypass caps, new power cord, new OS ROMs, replacing several old ICs, repairing voice #1 & panel switch LED. 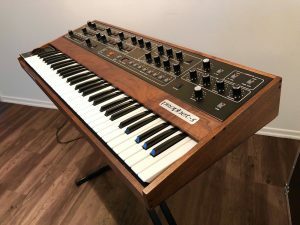 Huge warm analog tone, maybe the most classic of all the polysynths, the Rev 2 is THE Prophet 5 to get as it has a warmer tone than the Rev 3 versions with the Curtis Chips. As one friend recently told me who tested side by side a Rev 3 with Rev 2, the tone is so different it’s not fair to even call a Rev 3 & Rev 2 the same synths. He described the Rev 2 to have a warm magic (and inspirational) sound that was lacking in the Rev 3 (harsher and more sterile). 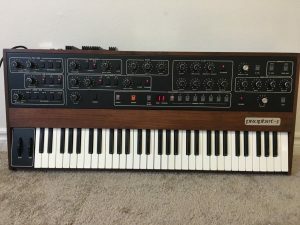 “This listing is for a Sequential Circuits Prophet 5 Rev 3.0 Analogue Synthesizer, Kenton Midi and Flight case (actual item in images). The unit works as it should and is in superb condition (please see images). All switches and pots works perfectly. The synth is set to 240V. Fitted with internal Kenton midi. Flight Case included. Near Mint. 1. As with all of these Prophet’s, the bushings on the keyboard have worn out so the action is janky as is. BUT, I’m including a brand new set of bushings with lubrication. Unfortunately I don’t have the time to make the change myself, but one can change the bushings easily and in less than two hours … see youtube. 2. Two of the LEDS are out: OSC B SAW & Unison — both buttons still function … the leds are just burnt out. 3. In the Wheel-Mod section, the PW A button is stuck. Easily remedied by opening the synth up and unsticking it. 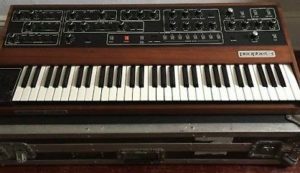 “For auction here is a vintage Sequential Circuits Prophet 5 Rev2……..serial number 486. This a one owner P-5. I purchased this Prophet new, in 1978, and used it for approximately three years. It was then put into storage inside its Anvil case in my warehouse/rehearsal building. That building, which I have occupied for the past four decades was sold last summer, and I got notice I would have to move out. I got the Prophet out last fall, and it would not power up correctly. I shipped it to Wine Country Sequentials in early April. 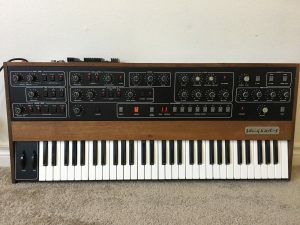 Wine Country has been servicing and modifying Sequential Circuits product since the early 1980’s, when the Sequential factory ceased operations. 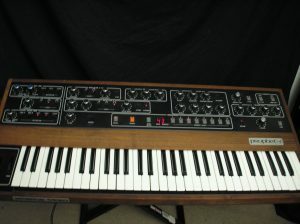 They are considered the Prophet 5 experts. 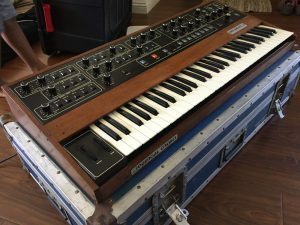 I received delivery back from Wine Country last week, and this Prophet has been refurbished and serviced, and is now ready for a new owner. 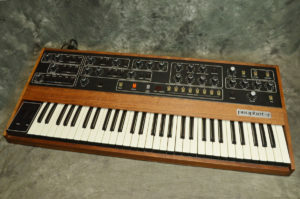 The Rev2 Prophets were designed with the revered SSM chips, and are considered by most to be among the warmest, fattest sounding synths ever produced. The sound and flexibility of the Prophet 5’s are legendary. This one keeps with that tradition, and sounds incredible. This Prophet is in excellent cosmetic condition. When I took it out of storage, I discovered that the guest keyboard player in our band had put tape with preset locations written on it, on six keys at our last gig, and the tape was not removed when the Prophet was put back in the case. When I removed the tape last fall it left some gray discoloration on those keys. It is not really that noticeable, and of course does not affect operation at all. A viewer asked what the modification between the Master Tune and the volume pots is It’s a 1978 Sparkomatic LED dashboard clock that is held there with double sided sponge tape. I put it on when I bought the Prophet to keep an eye on the set times while playing gigs. Still works………..it will pull right off. Sorry,I did forget to mention it when I posted the unit.